Audi announced the new generation of the mini-hatchback model A1 last year. Now the terrain version of Audi A1 Allroad also appeared when the cute model was slowly starting to appear on the roads! 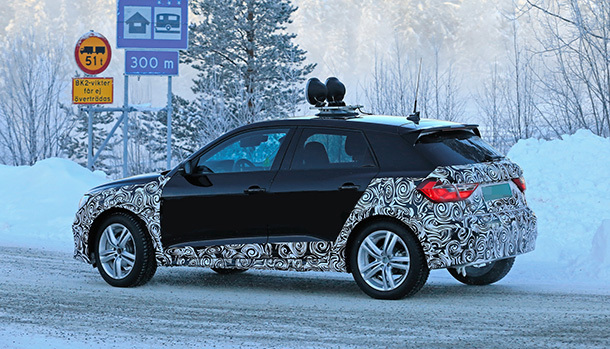 The Audi A1 Allroad has appeared in challenging winter tests! The German brand's A4 and A6 models are now available for the smallest member of the family. Spy shots in front and rear of the car covered with a light camouflage field conditions made for a number of innovations. High driving position, large fenders and new suspensions stand out as notable innovations. Despite the Allroad package, it is unclear whether this version of the Audi A1 will have a Quattro drive system. Audi Allegedly, because of the cost of the vehicle rather than front-wheel drive four-wheel drive, but supported by advanced traction control system is planning to make. That's a milestone for Allroad. In addition, the engine options of the vehicle will naturally depend on this decision. Sounds like an allroad version of the Quattro system. However, with the Q2 model, the A1 Allroad model will show how a sales performance will be.